Hi guys i'm here to tell you about edo. edo is a very effective way to keep your life organized. The amount of stuff that we share every day is huge, files that you get from friends, family, and team members are uncountable. They just keep coming in. We spend so much time and energy looking for this things, because we never remember where they are and how they were sent to us. The one thing we always remember is who we get them from. 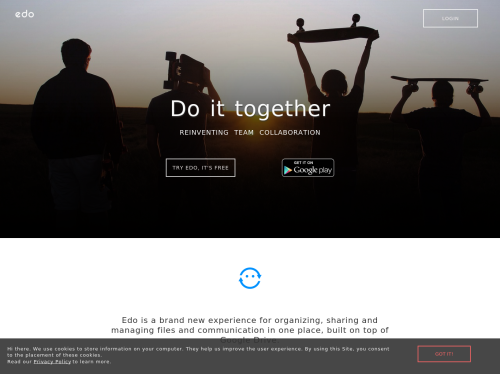 That's way edo is designed as simple as a chat. With all of your contacts and group of contacts on a side of the screen, sharing files is very easy. You just drag from the computer onto your friend's timeline and that's it. You can even add a comment to tell your friend or team member about that file. All the files you share will be accessible anywhere from any of your devices. How may times have you found yourself wanting to remember things you notice on the go? Things that inspired you, photos, links to web pages, sound recordings…. With EDO you can just throw things on your private timeline, adding text, links and whatever you need to remember. It’s just as easy as chatting with yourself.